I see a woman and man's portrait. its both!!! i learned abt dali before he did dis thing called surrealism its great!!!! 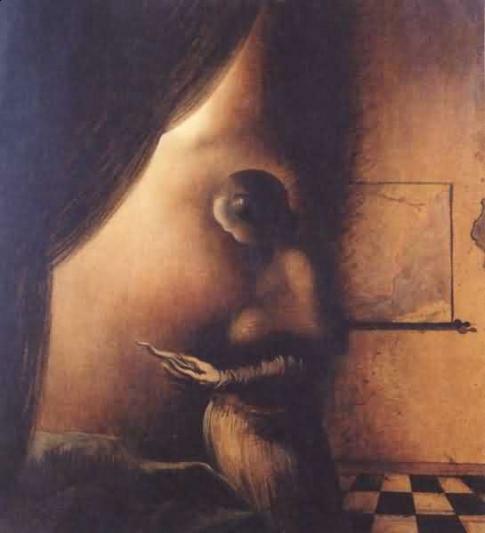 Its a wierd painting the womans head is the mans eye.Her chest and back is the mans nose.Her arm and the thing she is holding in her hand is the mans mustach on his face.And the bottom of the ladies dress is the mans beard. I would call it a glim because shes part of the man and the mans part of the lady.Its ghosty to so I would call it a glim.